It is no surprise that I am a fan of maxi skirts. I showcased it last month, and last year I wore them twice on the blog, early Spring and middle of Summer. There’s something about them that makes them so elegant. Brings out my inner girlyness and all I want to do is twirl and twirl. I’ll probably stop after a couple twirls because let’s be honest, I get dizzy very easily. I can never ride the teacups at Disney World or Disneyland haha. However, wearing a pleated maxi skirt can have its drawbacks. They may not be practical to wear day to day and/or figuring out when to wear them may be difficult. Since I enjoy wearing this type of skirt often, I have figured out how to wear a pleated maxi skirt without over-doing it or looking like you are about to head to the Oscars. 1. Keep the top simple. Wearing just solid colors or a simple top will tone down the dressed up look of a pleated maxi skirt. I would also stick to cotton fabric tops. The more casual the top, the more toned down the entire outfit will look. Avoid any patterns, prints, or dramatic tops. I highly recommend wearing a solid color short sleeve, v-neck tee or a sleeveless, v-neck tee. Accessorizing usually elevates the outfit. So only accessorize what is necessary. If possible, no jewelry. If I do decide to wear a piece of jewelry, I would just wear my favorite rose gold watch. I love crossbody bags. They’re the most practical bag and perfect for everyday use. They also pair well when wanting to keep the maxi skirt as a casual look. I highly recommend wearing a small crossbody bag. Lately, I’ve been eyeing J.Crew’s mini bag or Sole Society’s zipper bag. Are you into straw bags? They’re the ‘it’ bag of the summer and extremely casual. Basically the perfect combination of dressed down and cute. I especially love wearing it with two-banded sandals. They keep everything casual and they’re super comfortable. Too cold for sandals? Ballet flats are a great alternative! I definitely recommend avoiding any shoes with heels. They will definitely dress up the skirt even more. Hope you all find this helpful and hopefully you can start wearing pleated maxi skirts more often this summer! Great tips and precious outfit! The colors are perfect for summer! I absolutely love it and what great pictures! I love these skirts but never quite know how to wear them so you gave some awesome tips! The print of this and the soft pink is just beautiful on you gorgeous girl! Such a cute outfit and love that maxi skirt! What a gorgeous floral maxi skirt, Rach. And I love the flower bouquet as well! This skirt is gorg on you!! Love how you styled it! Thanks Allie! I had no idea you are in Chicago! heyyyyy! I love pleated maxi skirts! It's so fun to sashay around all day…!! 🙂 This one is beautiful! Thanks Christina! Yes it is really fun to sashay in it! 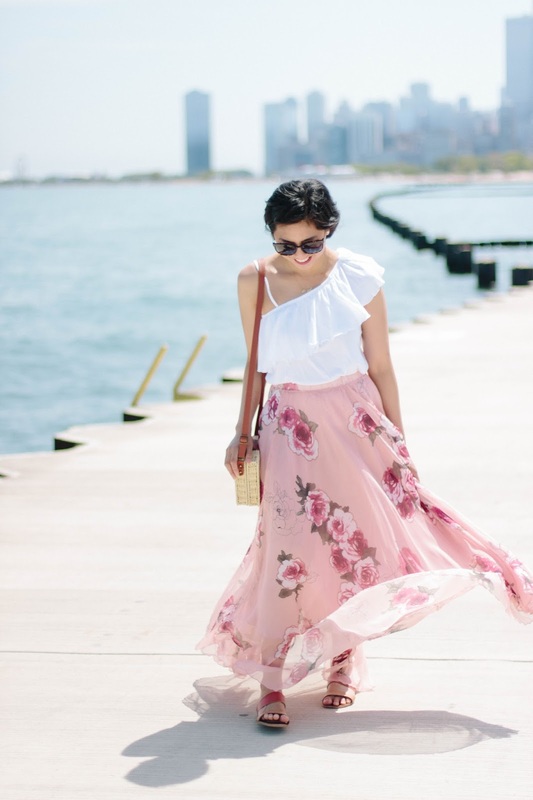 These are all excellent tips on styling a maxi skirt! The only thing about wearing flats with maxi length hems for me is that I'm quite petite and unless I get the hem altered, I end up just looking like I'm drowning in fabric. I adore your skirt – it's so pretty, romantic and flirty! Excellent styling as well with that one-shoulder ruffle top! Oh yes, I have that issue too. I do get mine hemmed. Luckily, the one I am wearing in this post happens to be the perfect length. But for the others I have featured, I for sure had to trim it. I agree with keeping the top simple with maxi skirts! I love this one on you! 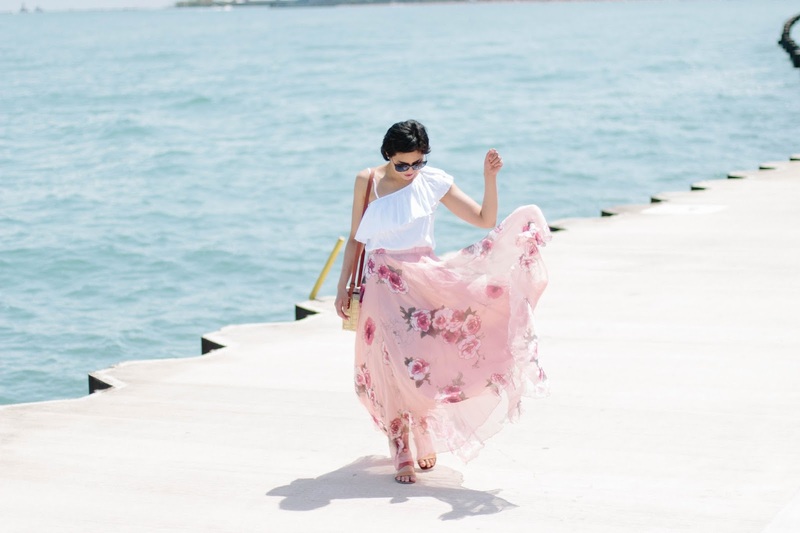 So cute how you played the peonies off of your skirts print! It's just lovely. I just love peonies! I couldn't resist when I saw them haha! Thank you so much!! I scored mine at Amazon and I love it. I wear that bag all the time! this skirt is so beautiful and i'm in love with the print! Impressive skirt!! I love it! I'm a big fan of maxis and I so love this outfit combination! Beautiful maxi skirt! love how you paired it with that assymetric ruffle top. So chic and great tips too. You look so pretty. I love your new hair cut. I wish I was bold enough to wear maxi skirt and flats, but with my height it always scares me so much . Love love the look, very feminine, and it's casual yet so chic. And the tartan bag is so lovely! So pretty, lady! I love the flow of this skirt- how gorgeous! One of my favorite looks of yours! You do maxi skirts so well. I just love this floral with the white one shoulder. Such a great combo! This is so pretty! I love the skirt. And I love cross body bags- so handy! 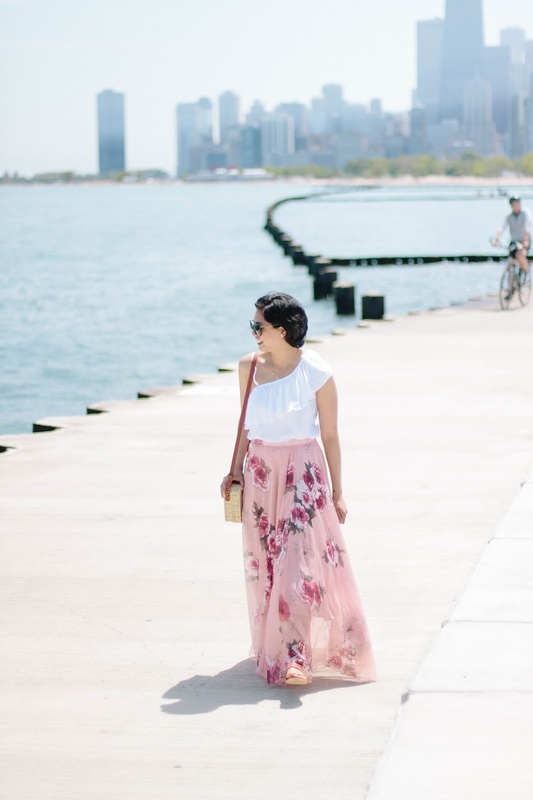 Oh, I love the peonies and the gorgeous maxi skirt! What a fab styling idea – that is the prettiest skirt I've seen in a while. And your style is always impeccable! it rely looks so chic! I'm in love with this look on you. So soft, chic feminine outfit with great ensemble. You look divine! Thanks for the styling tips. Great one-shoulder top and stunning skirt! I just ordered a pleated maxi…if it looks half as good on me as this does on you, I will be ecstatic!! This is such a pretty look, babe!! This skirt is gorgeous girl, I love the color and how the print is perfect for summer! What an adorable maxi skirt! I appreciate all the tips too.